I’m going to post this on both of my blogs because I’d like to help my friend Jim spread the word. Jim Colton is a guy from Chicago who I’ve gotten to know through the site Golf Club Atlas and Facebook and chatting on gmail. He loves the NBA, the University of Illinois and is obsessed with golf. He loves days in which he can play multiple rounds of golf. My idea of a big day is 36 holes, but Jim is very cool with 54 or 72 holes in one day. On June 22nd — that would be one of the longest days of the year — Jim is going to try to set a new record. He wants to play 108 holes in one day at Ballyneal Golf Club in Colorado. Walking every one of them. Is he crazy? Maybe. But he’s doing it for a good cause. Here’s where you come in. I’ve posted the copy Jim\’s recent blog post below. Give it a read, click on his link and if you’re inspired do anything, then do so. And Colton, when you read this, just know that I’m in for $100. So far, Jim has pledges for more than $14,000. Hopefully that number continues to grow. To my friends and loyal blog readers,Anybody who has ever been out to Ballyneal knows the caddies are a big part of the experience. Most are high school and college kids from the area. And “area” is defined loosely, because some come from up to two hours away just to earn a $75-$100 dollar loop and a chance to be an Evans Scholar. Over the years, seven Ballyneal caddies have earned scholarships at Colorado University through the Colorado Golf Association Eisenhower-Evans Scholarship Fund. Since my first trip to Holyoke in 2008, I’ve had caddies that run the whole gamut – from caddies on their first loops to ones that who know every inch of the wild Ballyneal greens. Either way, every experience I’ve had there with the caddies has been a positive one. They are simply great kids – warm, down-to-earth, helpful and hard working – consistent with just about everybody else I’ve ever met in that region of the country. Getting to know the caddies and building relationships with them over the years is one of the best parts of Ballyneal. Of course, it didn’t take long for them to realize that I’m a golf-crazed maniac, and I get needled for it constantly. The caddies are constantly egging me on to play more holes…to keep chugging for 72 holes after just finishing my 54th, for example. Last year, two caddies, Nick Flaa and Gary Nelson, threw down the gauntlet and played 100 holes in a day. Their primary motivation was just to get under my skin. My gut reaction was to immediately go out and bring the record back to its rightful owner, but scheduling, conditioning and footwear issues forced me to postpone it until 2011. Now armed with three new pairs of True Linkswear shoes and about 25 less pounds of spare tire, I’m ready to take on the challenge and raise the bar even further. Six-full rounds — 108 holes, is my number. During the offseason, I started to make plans to use the marathon to raise money for the local Holyoke High School golf team and the CGA scholarship fund. To give back to the kids who had meant so much to me. But unfortunately, a much more pressing need became apparent recently. One of the caddies, Ben Cox, was seriously injured in a skiing accident in March (details here). He suffered a broken femur and broken neck and is currently paralyzed from the chest down. But Ben is in great spirits all things considered and is ready to take on the long recovery process head-on. When I heard the news, I knew I had to switch the focus of the marathon. On Wednesday June 22nd, I will be walking (at least) 108 holes of golf to raise money for Ben and his family as they begin to face this long recovery process. If you’ve been out to Ballyneal and have enjoyed your time there, or have gotten any entertainment value out of this blog over the past five years, or you simply want to help, anything you can contribute on a lump-sum or per hole basis is greatly appreciated. You can e-mail me directly at jcolton31@gmail.com and I will provide more details on how to contribute. Also, if you want to take an active role in this fundraiser, I’m willing to host anybody who can raise $500 or more on their own to join me at Ballyneal on June 22nd for what I’m calling the “half-marathon” — 54 holes in one day. My only request is if you see a single lefty in an orange hat coming up on your group, please let him play through. So Jim might be a little obsessed. And I like that. He makes me seem grounded when it comes to my level of interest in golf. Over the past several nights, I’ve been going back in time in my mind. It was the fall of 1994 and the winter of 1995. I was barely out of college, didn’t really know what I was doing as a journalist and I was living in an upstairs apartment in an old house in Buffalo, New York. Since the NHL playoffs began, I have found myself interested in this series between the Buffalo Sabres and the Philadelphia Flyers. I’ve caught some of it on the NHL Network (because Versus and NBC seem to have far more interest in other series) and thought kind of longingly of my six months or so in Buffalo. I was working a temporary gig for the Associated Press. I helped cover the Bills at times, on several occasions I drove down to Olean to cover St. Bonaventure basketball (including once when the opponent was a John Calipari-led UMass team) and I covered a bunch of Sabres games. While I have a very soft spot in my heart for some of the other places I’ve lived including Phoenix, Cincinnati and Raleigh, I rarely even think about my time in Buffalo. That’s kind of too bad. It was a good experience. Because of a NHL labor issue, I covered some interesting things. I once waited outside of the NHL offices in Toronto with a bunch of media from Canada. I covered a 4-on-4 hockey thing with NHL stars in Hamilton. I went to a OHL game in Niagara Falls to write a story about the younger brother of Eric Lindros. The AP offices were located in the Buffalo News, so I got to know a number of people on their staff. I became friends with Jerry Sullivan and Mike Harrington. I learned a bunch about hockey from Jim Kelley and it was a sad day this winter when he died because he couldn’t have been nicer. I remember seeing Christian Laettner’s father, who worked at the News, I think in the press room or something. But after seeing playoff hockey back in Buffalo, I think about the Aud. It was such a wonderful old building for hockey. It was loud, the fans cared, it was pretty cool. I remember how there was no elevator from the press box to the arena floor. I remember how tiny the locker rooms. I remember the first time I covered a postgame in which the coach (in this case Marc Crawford of the then-Quebec Nordiques) answered questions in French and then talked to the rest of us in English afterwards. I think it is cool that because of Buffalo’s proximity to the border — and that a good chunk of its fan base is on the other side of the border — that they play both the Star Spangled Banner and O Canada before every game, regardless of opponent. I actually covered the groundbreaking of the building the Sabres currently play in, the HSBC Arena. It was initially called Marine Midland Arena. It is just down the street from the Aud and basically across the street from the News. There are other memories as well. There was the convenience store down the street where I would buy papers. There was the Elmwood Taco and Sub that seemed like the greatest place for late night food ever. There was the time the Vikings were in town and we went for dinner and a certain columnist told the waitress at the infamous Anchor Bar to bring us “a hundred wings.” I remember day trips to Toronto if for no other reason than because I could. I’ve only been back to Buffalo once since I left in March 1995. When I covered North Carolina, the Tar Heels played at game at the U at Buffalo because Ed Cota had ties to the Bulls staff. It was a quick in-and-out trip, but the day of the game, I went up to Niagara Falls and crossed the border with my guy from the Durham paper in part because he had never been to Canada. I would love to go back to visit. It would probably be preferable if it happened in the summer since I’ve pretty much only been there when there has been snow on the ground. Because of that, I’ve been following this Sabres-Flyers series pretty closely. The past two games, I’ve listened to a little of it on the XM feed of WGR in Buffalo. I’ve gone to the Buffalo News site and read stories. And I find myself pulling for the team from the Western New York city that has had more downs than ups in recent years. On the topic of Buffalo, here is a cool video that the Hockey Night in Canada crew did on the Aud a few years ago before it was torn down. Is April the best sports month? I know people love March, but I’m now of the belief that April is better. In most years, you get the NCAA basketball title game, you get the Masters, you get baseball’s opening day and you get the beginning of the NBA and NHL playoffs. And how good have the playoffs been? There have been great games in both sports on nearly a nightly basis. And I don’t even want to hear people say how the NCAA tournament is better than the NBA playoffs. How about those Twins? I have been accused of being negative and being a cynic, but I didn’t think they’d be this bad. I had more concerns about the bullpen than most (which has shown to be at least somewhat of a legit concern). I told people that Pavano needed to again be good and eat innings for this team to be good (he has been average). But I didn’t think the bats would be this cold. While the season is long, the Twins are 10 percent into the season. At some point in the next few weeks things will go from this being a slow start to being a legit concern. 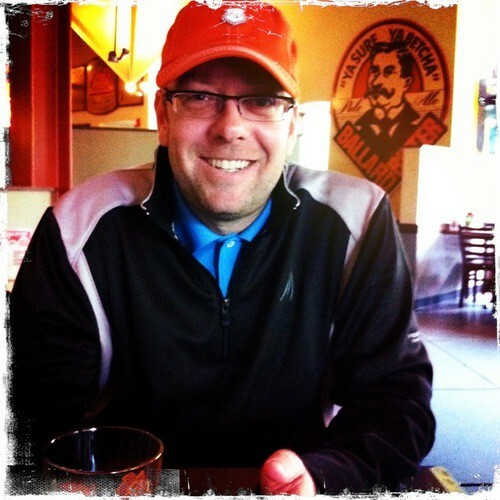 If you miss my golf posts: I’ve been trying to spare you from my golf-obsessed ramblings. Want them? Click over to onlygolfmatters.com and read away. I once made a 10 in a tournament. But I’ve never made a 16. The most amazing thing might not have been the fact that he made a 16. It is that he still shot 80 while making a 16. To say Kevin Na got in a little trouble yesterday is a serious understatement. This is crazy. I’m not going to lie, I’ve been waiting for tonight for quite a while. Because I’m one of those people. I’m one of the few that has been into Friday Night Lights from almost the beginning. A friend of mine said there are two kinds of people: Those who love Friday Night Lights and those who haven’t seen it. I can’t disagree with that statement at all. Tonight, those of us who don’t have DirecTV or haven’t run out to pick up the DVD will finally get to see the final season of Friday Night Lights as it begins its run on NBC. We once again get to see Connie Britton and Kyle Chandler. We once again get to see a cast of previously unknown actors grow before our eyes. We get to watch ourselves get captivated by the storylines. Here is a story previewing the final season of the show. “I know what you’re thinking: Here’s another preachy TV critic spewing an eat-your-vegetables kind of sermon. Guess again. I’m urging you to give “Friday Night Lights” a chance not because it’s good for you in the way that say, “The Wire,” is good for you. I’m urging you to watch because this just might be the blind date that pays off in the TV love of your life. From town rabble-rouser Tim Riggins (Taylor Kitsch) and troubled but talented quarterback Vince Howard (Michael B. Jordan), to beauty-queen heartbreaker Becky Sproles (Madison Burge) and headstrong Jess Merriweather (Jurnee Smollett), this show is teeming with characters who worm their way into your heart. Just give them two or three episodes to form a bond and, odds are, you’ll find yourself cheering their triumphs, crying over their disappointments and cringing at their mistakes. Why? Because they feel so incredibly honest and real. My advice is much like the advice in the story: Give it a shot. Either start tonight. Or start watching old seasons of the show on Netflix (you can stream previous seasons). I think you will like it. Because there’s a dirty little secret about the show: It’s not really about football. It’s only the most honest show about teenagers and growing up in a smallish town that I’ve ever seen. You don’t have to like sports, you don’t have to like football, you just have to like good television. How fired up am I? I’ve been watching episodes from the the first season again on Netflix. Once again, I’m hooked. I can’t wait to see what happens. This is worth a watch. We are awfully fortunate. 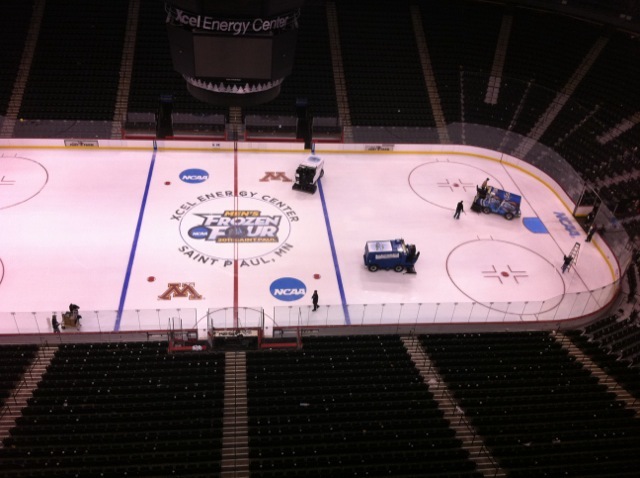 What does it look like when the Xcel ice is redone? As some of you may know, I covered some college hockey this past weekend. Because of a family situation, AnnArbor.com (the former Ann Arbor News) needed a last minute emergency starter to cover the Frozen Four. I took the gig late Wednesday afternoon and covered Michigan both on Thursday night and Saturday night. It was a good gig and I had a good time time. 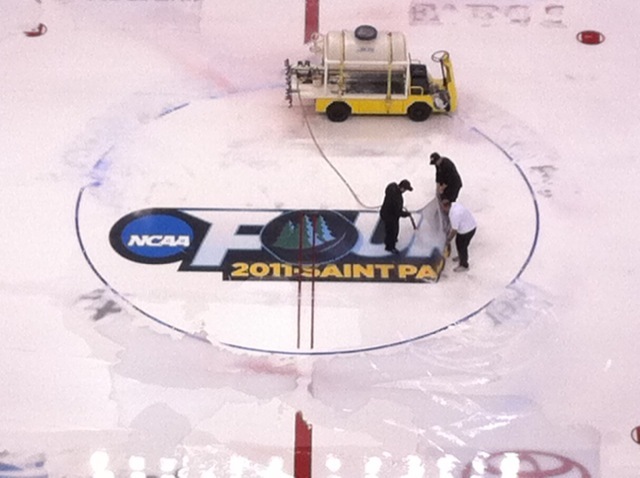 But when I got back up to the press box on Saturday, I was captivated by what was going on down on the ice. 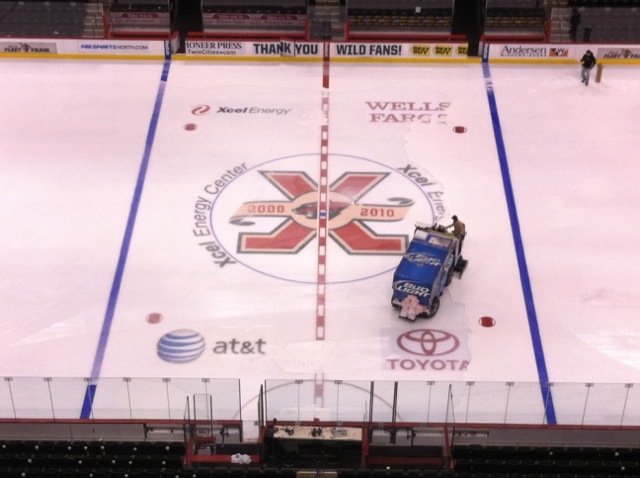 Because of the schedule at Xcel Energy Center, the crew there had a lot of work to accomplish in not a lot of time. The Frozen Four ended Saturday night and the Wild played an early Sunday evening game. I don’t know a ton about changing over buildings, but this one seemed like it would be more difficult than most. For the record, my descriptions below are kind of a guess of what’s going on based on my observations. Some of it could be right, some of it might be wrong. But this wasn’t just changing the signage on the boards — which isn’t all that tough because those ads are basically just big stickers that come off pretty easily. This change over also required changing the ice. 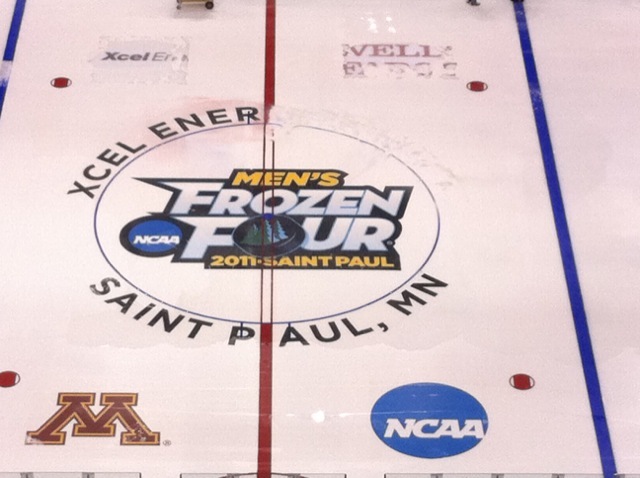 For the Frozen Four, a logo for the event was on center ice and the spots in the neutral zone where there are usually ads had logos either for the NCAA or the University of Minnesota, the host institution. What became pretty clear pretty quickly was that the Xcel crew put down additional ice on top of the ice usually used by the Wild. So it wasn’t like a new sheet of ice had to be put down. The crew just had to get rid of what was on top of the Wild logo. In this photo, you can see that the word “Center” had vanished from center ice and that the two tournament logos at the top of the photo were gone. I didn’t really know how these logos are put into the ice, but in this case, there were actual printed logos that were put into the ice. They looked to be printed on a fairly durable material. In the photo below, you can see the guy in the white pulling up on the logo to get it out of the ice. From high above the ice, it looked like the tub on the cart was filled with hot water. 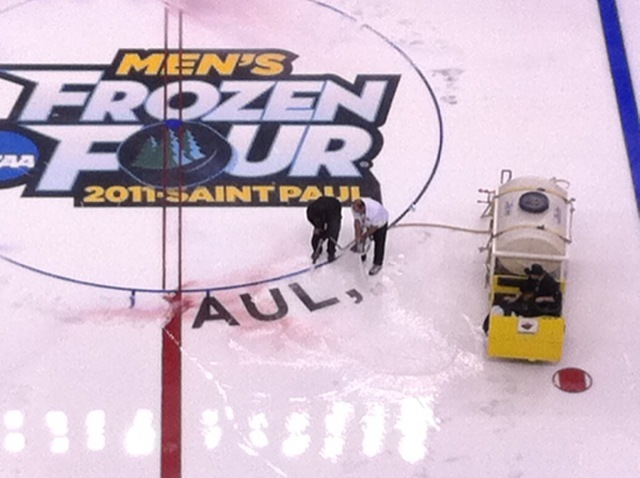 That water was sprayed on the ice to melt it and allow workers to pull up the logo. 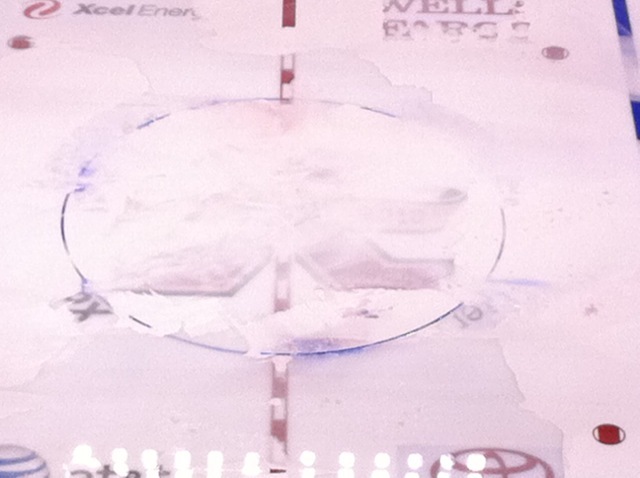 Here is what center ice looked like a little later. Below is the final picture I took (sorry for the not so great iPhone photos) on the night. You can tell that in the span of 90 minutes to two hours, a lot of work got done. It isn’t complete, but it certainly going in the right direction. While the logo removal was going on, there was a crew working on board signage — what you see below is different than what was up during the weekend — and another group with what looked like an edger working on the ice. It looked like they were trying to make sure that there wasn’t a lip around the rink and that the ice was flat. It has been a pretty good run of late for this guy. Thursday: Covered Michigan vs. North Dakota in the Frozen Four. Friday: Worked a half day. Went to the Twins home opener as a fan. Had good seats, the weather was better and a good time was had. Saturday: Played my first Minnesota round of golf at Logger’s Trail in Stillwater. Hit it OK for April 9. Since I was so close to Wisconsin, I drove to Hudson, picked up some New Glarus beer (unavailable in Minnesota) and smuggled it back across the border. Tonight, I’m covering the national championship hockey game between Michigan and Minnesota-Duluth. Sunday: The weather is supposed to be dreadful, but I’m OK with that. Why? Because I’m going to watch every shot of the final found of the Masters. It will be glorious.